Solvvy vs. AnswerDash - Which Intelligent Customer Self-Service Platform is Best For Your Business? You’ve done your homework and you realize that your website or web app needs a better way to help your customers help themselves. You are thinking that now is the time to leverage artificial intelligence (AI) to predict their questions and answer them on-the-spot without having to rely on a human support rep.
And now is a better time than ever to get started. Today’s AI has the ability to do all sorts of great things for your business, such as reduce support tickets, reduce website abandons, convert more sales and even increase CSAT scores. So how do you make the right AI choice for your business? There are several really good AI self-service support solutions available today, and they all have different strengths and primary features. Here we take a look at Solvvy and AnswerDash, comparing the two frontrunner’s head-to-head so you can find the best choice for your business today. First thing’s first: why go with self-service at all when considering an AI solution? As we mentioned, advances in technology today have given customers more power than ever - and they want to use that power and have a greater self-service experience. In fact, up to 75% of users claim that they do not want to talk to a support representative. Instead, they want to be empowered to help themselves and have an easy path to a support agent if needed. AI-powered self-service solutions can take over to handle frequent, repetitive questions and low-value customer inquiries. As McKinsey puts it, “such channels are poised to become the gateway and triage medium for all of today’s live telephone contacts,” identifying and solving customer problems without requiring any human interaction. So what exactly are you looking for in a self-service customer support solution, and what should you keep in mind? Think, if you would, of the “customer support game” like a game of soccer. Your support rep is the goalie, fielding tickets and trying to block shots on the goal. The start of a support ticket - either via email, live chat, or phone call - is a shot on the goal, and obviously something you want to avoid if at all possible. In this context, some self-service solutions, like Solvvy, work as defenders trying to block a shot on goal for the goalie once the customer has initiated a support ticket, while others like AnswerDash work at all over the field as midfielders, trying to grab the ball long before there is ever a shot on goal (more on that later), long before a customer needs to submit a ticket. If your customer or website user needs human assistance - a.k.a if the shot gets to the goalie - you have failed them, and your site or app has failed the “self-service” test. So, how does each company focus on winning the game? Solvvy is a help island solution, meaning that it only comes into play on the support page, requiring the user to ask for help and leave the page that they’re currently navigating in order to find support. Then, once the user is on the support page, they try to use AI to solve the ticket and users have the option to type-to-search in order to find their answers. If they can help the user self-serve, they have deflected a ticket. If not, then the ticket gets passed to an agent. In this way, once again, it’s more of a defender, blocking shots and putting all of the action at the end of the field. When considering Solvvy, then, you have to ask yourself: do you want to offer self -service across your website or mobile app journey or only when they get stuck and cannot find what they need? Solvvy would be the latter, providing self-service after your website has failed the self-service test a.k.a after your users couldn’t find what they needed on your site and had to search for support. This is a defensive, reactive strategy, and it puts increased emphasis and work on your customer and your support agents. AnswerDash offers that kind of support as well - as a last resort. But most importantly, AnswerDash works to predict users questions, based web page content, before they need to start a support ticket. AnswerDash helps prevent sites from failing the “self-service test” to begin with. That’s why AnswerDash also has AI-powered predictive Q&A overlayed on all pages of a company’s site, rather than just on the support page. In this way, it works across the field like midfielders to steal the ball long before it gets anywhere near the goalie - and certainly long before there is a shot on goal or a ticket started by the customer. By offering self-service on every page, we give customers the opportunity to find the answers that they’re looking for directly at their point of need, rather than forcing them to leave the page or type to search. We predict the questions users have based on the page they are on (content/context) or based on their user profile is (if they have logged in). This makes the support customized and personalized, which is a huge plus for customers today. 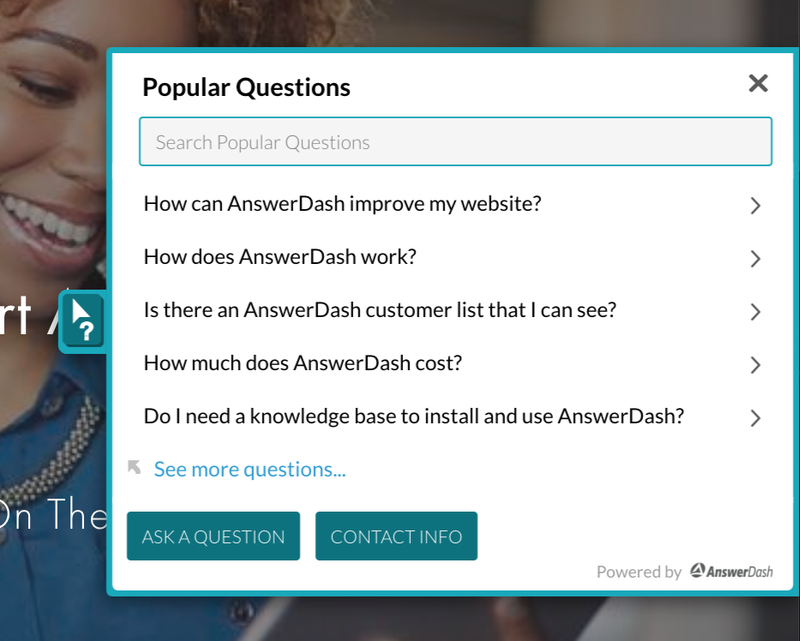 In this way, AnswerDash works to both deflect tickets that are "shots on the goal" and address tickets long before the user thinks that they need assisted service help with our Popular Questions on every page. Is ticket deflection a priority for your business? AnswerDash provides 3x the ticket deflection- through tickets, live chat, and popular questions - while Solvvy relies on tickets alone. So if ticket deflection is high on your to-do-list, AnswerDash may be for you. Newer PostHow Will Automation, AI and IoT Shape User Experience?